It is football time in Tennessee—and at Morning Pointe of Hixson. Each year, the residents of the assisted living community eagerly anticipate the arrival of college football season. They can’t wait to wear their favorite team’s colors and cheer them on to victory. “We have a lot of college sports fan at Hixson, and the fun rivalry has begun! Two of our biggest Vols fans are Executive Director-in-training Cody Harvey and resident Pat Arnold,” said Christine Rivers, the Life Enrichment director at Morning Pointe of Hixson. 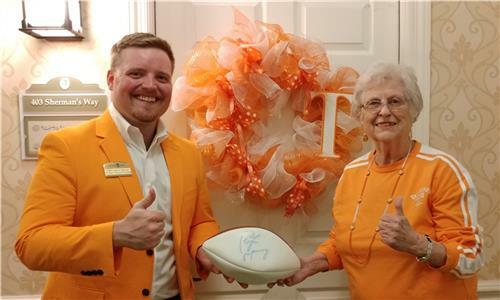 To celebrate the start of football season, Harvey and Arnold donned their Tennessee best—all orange and white, of course—and passed a football signed by Peyton Manning himself during his days as a student athlete at the University of Tennessee.